Democratic congressional candidate Abby Finkenauer of Dubuque spoke for about six minutes yesterday at The Des Moines Register’s “Soapbox” at the Iowa State Fair. Finkenauer also stressed her family’s roots in the labor movement. 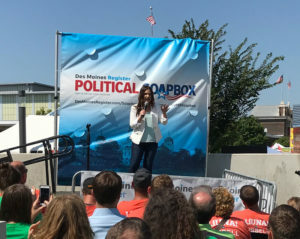 Finkenauer, a two-term member of the Iowa House, emphasized her opposition to Iowa Republicans’ efforts to roll back union rights. 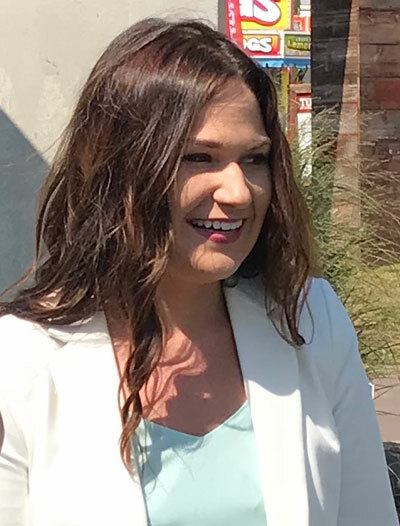 Finkenauer is challenging Republican Congressman Rod Blum’s bid for a third term in the U.S. House. The race is routinely listed as among the most competitive in the country. “The energy on the ground is amazing and we’re just going to make sure that we keep getting out there, keep hearing from folks and talking about what Iowans are discussing around their kitchen table,” Finkenaur said during a brief interview with reporters. Finkenauer indicated her campaign hopes to soon figure out a schedule for debating Blum.